Half acre of greenhouses housing owners collection of approximately 1000 mature cacti and succulents grown by the owner from seed over the last 40 years. A47 one mile from jct with A17. Turn south down Pullover Road leading to Eau Brink Road. Nursery on right past kennels after sharp left-hand bend. 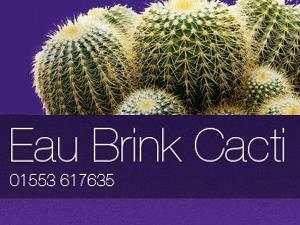 From King's Lynn station it is 4 miles to Eau Brink Cacti.